SAN DIEGO (CNS) - A proposal to redevelop the SDCCU Stadium site with a professional soccer stadium was handily rejected by voters, who favored a competing plan that will include a new stadium for San Diego State University football, according to final election totals released Wednesday. Voters on Tuesday resoundingly shot down Measure E, the so-called SoccerCity initiative, with "no" votes totaling 69.6 percent. With all San Diego County precincts reporting, roughly 54 percent of voters favored competing Measure G, the SDSU West Initiative. 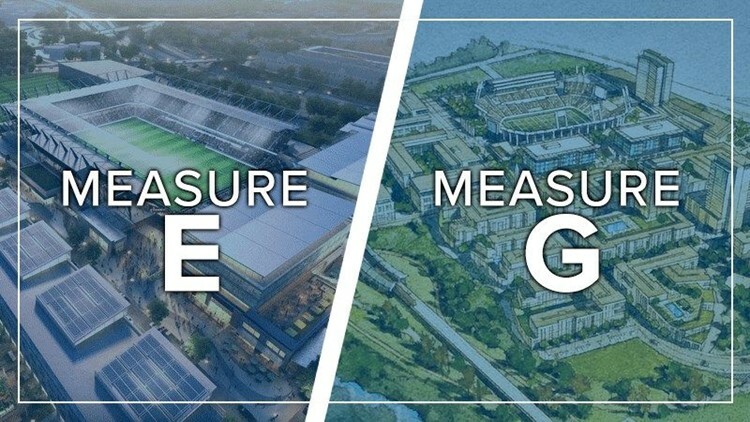 "With the overwhelming approval of Measure G today, San Diego State University will now have an opportunity to grow through an open and transparent process that will benefit our economy long-term," according to a statement from the Friends of SDSU alumni group, the measure's main supporter. "Even more importantly this vibrant campus expansion will increase access to higher education for generations of San Diegans to come." Backers of Measure E and Measure G campaigned for more than a year to redevelop the stadium site into a mix of commercial and residential space, a river park and, centrally, a new stadium for football or a potential professional soccer team. Measure E, the SoccerCity initiative, would have included a 23,000- seat soccer stadium that could have been expanded for San Diego State University football. Measure G, the SDSU West initiative, includes a 35,000- seat stadium for Aztec football. Crucially, according to multiple SDSU West supporters, Measure G includes a planned campus extension while Measure E did not explicitly state that one would be included. SDSU West supporters included San Diego County Supervisors Kristin Gaspar, Diane Jacob and Greg Cox, the Lincoln Club of San Diego County, the San Diego Chamber of Commerce, the Sierra Club, the San Diego County Democratic Party and San Diego City Council members Barbara Bry, Lorie Zapf, Chris Ward, Myrtle Cole and David Alvarez. We're incredibly proud of the plan we created, and we're even more proud of the team who pushed so hard for this vision. Against the strongest of headwinds, we enjoyed the support - shown in commitments of time, energy and passion - of thousands of San Diegans who had never participated in the political process before. We are deeply grateful to all of these die-hard supporters for their heart, their efforts, and their dreams for a better San Diego.